As a kid I loved magicians. One of my most cherished memories was when I used to go to magic shops with my grandfather. I was fascinated with secret compartments, velvet curtains and trap doors. Finally, after all these years I have found a way to apply some of those childhood memories to the art-making process. In this class we will be creating an art chamber with rotating art….literally. 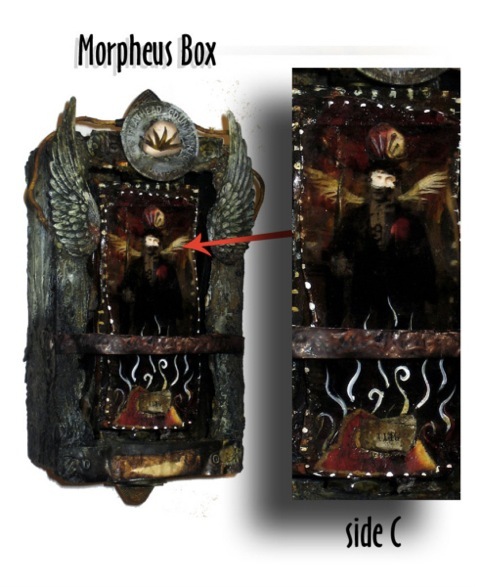 Using assemblage and collage the students will create shadow box that has not one, not two, not three, but FOUR options for the viewer. If you get bored with an image, simply give it a spin and…Presto…a new image appears….like magic. I will be showing students a variety of assemblage, techniques to build and adorn our chamber of change. Don't worry if you're not the handiest with tools...neither am I. My construction techniques are very simple and easy to follow. I do recommend two tools for the class that will make your life a whole lot easier: Dremel Rotary Tool and a power drill. After the construction is all done I will go over a multitude of painting techniques and collage techniques to get this transformation box looking nice and dreamy.